Hide this Project (Binori Sonnet) Discover properties in other projects by hiding the ones that doesn't interest you. You won't see them in your searches further but you can unhide anytime later. Hide this Dealer (Hiren) Discover properties by other dealers by hiding those whom you have already spoken to. You won't see them in your searches further but you can unhide anytime later. Hide this Dealer (SITARAMACHANDRA MURTHY) Discover properties by other dealers by hiding those whom you have already spoken to. You won't see them in your searches further but you can unhide anytime later. Hide this Dealer (Malay shah) Discover properties by other dealers by hiding those whom you have already spoken to. You won't see them in your searches further but you can unhide anytime later. Hide this Dealer (Saumil Gokhale) Discover properties by other dealers by hiding those whom you have already spoken to. You won't see them in your searches further but you can unhide anytime later. Binori Sonnet is one of the residential development of Binori Infrastructure (Binori Group), located at Bopal, Ahmedabad, Gujarat. It offers spacious and skillfully designed 2BHK flats. The project is well equipped with all the amenities to facilitate the needs of the residents. In which area is Binori Sonnet located?The project is situated in Bopal, SG Highway & Surroundings. What are sizes of apartments in Binori Sonnet? The apartment sizes in the project range from 950.0 sqft to 1260.0 sqft. 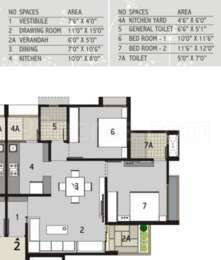 How much is area of 2bhk in Binori Sonnet? Two-room units (2BHK) in the project are available in an area of 950.0 sqft to 1260.0 sqft. What is the 2 bedroom price in Binori Sonnet? 2 BHK units in the project are available at a price tag of Rs. 4750000 to Rs. 6000000. What is the price of apartments in Binori Sonnet? The units available in the project are priced at Rs. 4750000 to Rs. 6000000. Does Binori Sonnet have kids play area? Yes the project has kids play area. Building with RCC frame in accordance wtih newly passed law by with AUDA with erthquake resistant design. Stylish main door with wooden frame, all other flush doors an windows in aluminium section with powder coating. Attractive vitrified tiles in all area. Black granite platform with S.S. sink, coloured glazed tiles dado upto lintel level. Good quality C.P. fitting and coloured glazed tiles dedo upto lintel level. Completely concealed copper wiring with sufficient electric points in all rooms. Smooth finish inside plaster with putty, sand faced out side plaster with water prrof acrylic paint.